Jobs that require portability require portable work lights, but having a cordless light is not enough. It has to be able to put the light where you want it. The LXLM03 looks like it does a good job of this. It has a head that folds up and down with 7 position stops, and can rotate to the left and right offering plenty of lighting angles. 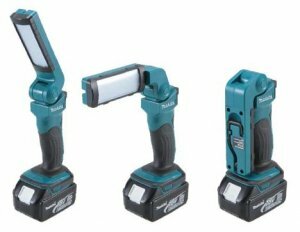 Makita's battery offers a flat bottom for the light to stand on, but it can just as easily rest on its side. If you need light higher up, Makita built in a metal hook that swivels 360 degrees and folds out of the way. The light comes with two lighting modes, one using all 12 LEDs and one using 6 LEDs. With all 12 LEDs ON, the light produces 240 lumens and can run continuously for up to 9 hours. With 6 LEDs ON, you get half the light (120 lumens) but get up to 22 hours of runtime. The Internet has the Makita LXLM03 price listed for around $54 (tool only), and we all know the Internet never lies. Note: This light is not listed on many sites, so it might not be available yet.